Another one of my New Year’s ‘goals’ is to refocus date night. As most of you know, having date night every week or even a couple of times a month can be quite a feat. For us, with opposite work schedules not to mention very full schedules, having weekly date night got lost in all the busyness over the past few months. And even the days and times we could spend together and count as date night, was spent doing lame things. Like running errands and grabbing lunch out, or picking up a movie from Redbox instead of the normal nightly movie resource, Netflix. So my goal for this year is to have ‘date night’ every week, do something different each date, all while not spending a fortune; because let’s face it, even if you do have the time for date night ‘going out’ can get expensive! One thing that can ‘eat’ up a lot of date night budget is going out to eat. After dinner out then you are left with little to spend on entertainment. So for many of my dates that have a special activity planned that costs a little bit more, I plan on eating dinner at home. This will save money, but can still feel like date night. By cooking dinner together, taking time to prepare a new recipe or a recipe that you normally don’t make, and turning off all the distractions, dinner at home can be as spectacular as dinner out! For more tips on having a romantic dinner at home check out this article I wrote last year for Valentine’s Day. For us, eating a steak house dinner at home or out is a special treat. Steak is not something I normally buy because it can be expensive, but it is way cheaper to prepare it yourself than eat out. Below is a simple recipe for Seared Sirloin Steak with Sweet Balsamic Wine Sauce. 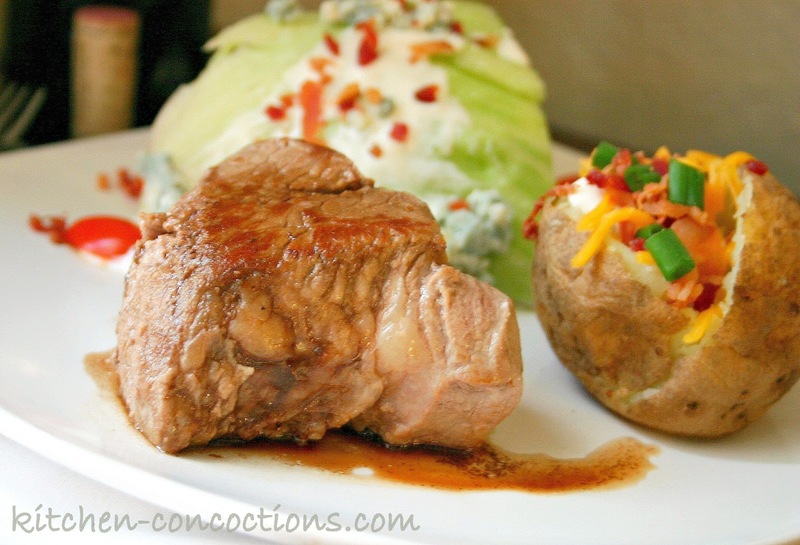 This recipe allows the steak to be the star of the show yet still have a hint of extra flavor! For the perfect date night in, serve up this classic steak with a bake potato, wedge salad and of course chocolate dipped strawberries for dessert. I have lots of fun, different and affordable things planned for the next few weeks. Eric even chimed in and wants to start planning some dates too! I can’t wait to see what he has in store! For those of you struggling with date nights with your loved one, would you like me to share some of my date night ideas in future posts? And those of you that are super creative or have fun date ideas of your own please share in the comments below! I’m sure we all could use some inspiration! Season beef on all sides with salt and black pepper. Heat a 12-inch nonstick skillet over medium high heat and until hot. Add beef and cook 3-4 minutes. Turn and cook 3- 4 minutes longer or to your desired doneness. When beef is done, place on cutting board, cover with foil to keep warm, and let stand. Meanwhile, in a small bowl, combine remaining sauce ingredients. Stir to blend. Add sauce mixture to pan residue in skillet. Bring to a boil over medium high heat and cook 1-2 minutes, scraping bottom and sides of skillet. 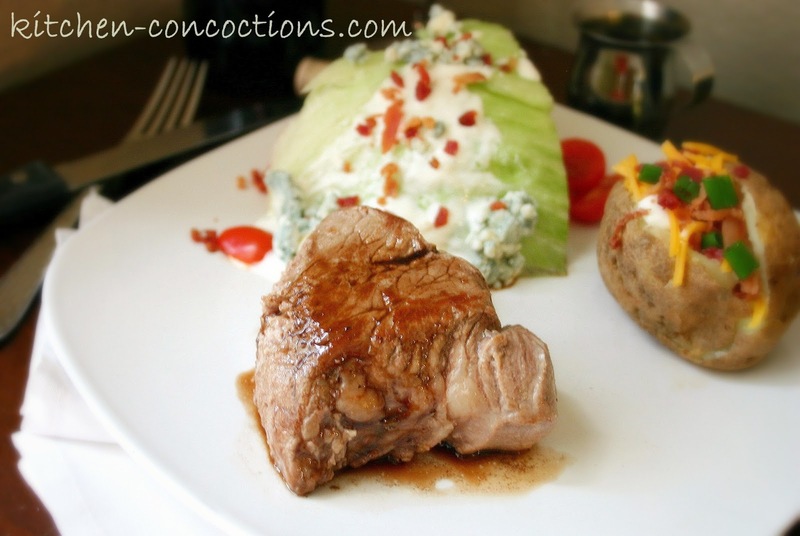 Serve cooked steak with prepared sauce.